PORTLAND, Ore. (CNS) — Wrangler doesn’t have an MD and he can’t write prescriptions, but he works hard to help children who are injured or ill and often scared. “It’s a high-stress environment that kids don’t have any control over,” Garland said. Studies and observation show the physical and psychological benefits of animals. In the presence of a dog such as Wrangler, blood pressure and heart rate can drop. “Within 12 minutes of petting a dog, the body releases oxytocin,” said Garland. Sometimes called the “love hormone,” oxytocin plays a role in bonding and people’s sense of well-being. Children often open up to the mellow Labrador, telling him concerns they haven’t shared with hospital staff. “Experiencing things that are warm and familiar, such as dogs, during that time can make the difference as to whether children get traumatized or not,” said Jochim. 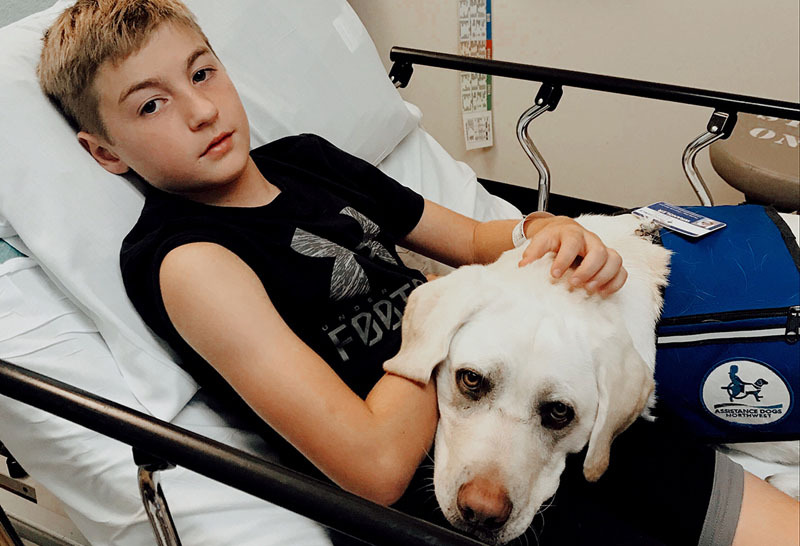 Although some organizations use different definitions, “assistance dogs” generally is an umbrella term that includes service dogs and facility dogs, explained Stacy Goodfellow, Assistance Dogs Northwest program manager. Service dogs are paired with one person and help him or her with daily tasks, for example opening doors or picking up items. Guide dogs also fit this category. Facility dogs such as Wrangler receive extensive specialized training from an accredited organization and learn specific skills. There also are therapy dogs, who need to have a good temperament but can be someone’s pet. They may, but don’t always, go through a certification program. Many hospitals have therapy dog programs, including St. Vincent. To keeps Wrangler’s skills fresh, he receives mini training sessions every day; to keep him fresh, he receives weekly baths and daily teeth-brushings. St. Vincent, founded by the Sisters of Providence in 1875, offers Wrangler trading cards and a stuffed animal in his honor. He also receives fan mail from grateful patients. He has also made a calming impact on the staff, said Garland.